UP Mera Hunar Free Registration 2019 | Apply Online for UPSDM Kaushal Vikas Mission | USER ID & Password | UP Mera Hunar Registration Form 2019 | Hunar Mera Scheme in UP ADD Name List check status. UP Mera Hunar Free Registration 2019 Perfect Meaning of Mera Hunar Scheme in UP is Add Your Educational Qualification in www.merahunar.com and get jobs in local companies which registered under Government list. The scope of Mera Hunar Yojana is very bright. When I visited first time on website I realize Hunar means to make employment to youth or may be some investor type feeling to make entrepreneur but Mera Hunar is something different and HE/SHE or ex-service/old person can registered them to get suitable jobs in District. UP Mera Hunar Free Scheme 2019 Mera Hunar Scheme is launched by Chetan Chouhan who holds important posts in Uttar Pradesh Cabinet Minister. While giving scheme of Mera Hunar, Shri Chetan Chauhan said we have targeted to skill and trained students, youth after 18th years age limit to train more than 2 Lakh people per year. Chief Minister Adityanath Yogi said in Summit of Uttar Pradesh Skill Development and Employment that Samsung, Micromax, Lakme and other Korean, America, Chinese company is working to generate employment on local people. Merahunar.com: The Main Objective of Mera Hunar is "Sabko Hunar, Sabko Kaam". Rajesh Kumar (Director of Skill Development) said to journalist on his mission to reduce unemployment. 1. Time To Time Jobs fair, Rojgar Mela organized in office of Sewayojan or UP Skill Development department. 2. Recently one job fair completed 400 entries. 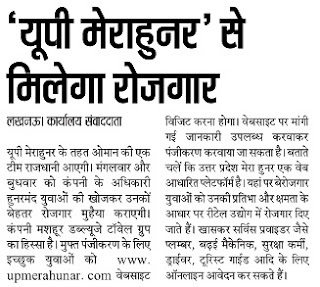 How to make registration in mera hunar: Interested and Eligible candidates may sign up and apply for http://www.upmerahunar.com/#!/ and collect User id and password with email. 1. You may receive otp number in mobile number and email. 2. Make Unique user id for better placement and find. 3. You will get star rating according to your skill. 4. Add your daily income, wants jobs on Rs 100 per day to maximum per month salary.